Evergreen dwarf shrub, native to the western Mediterranean region, naturalizde in Europe, 20-40cm high; square erect twigs, much branched, woody at the base; leaves opposite, lanceolate or ovate, the margins revolute, the underside hoary; flowers pale pink to violet. There are numerous chemical races with various dominant components present in the essential oil (1.5-4%, french cultivars up to 6.5%): thymol, carvacrol, p-cymene, linalool and its acetate, alpha-terpineol, campher, geraniol and geranyl acetate. Oils of commerce are dominated by thymol (30-50%), accompanied by p-cymene (15-20%), γ-terpinene (5-10%) and carvacrol (1-5%). The quality standard of Ph.Eur. defines contents of thymol (36-55%), accompanied by p-cymene (15-28%), γ-terpinene (5-10%), linalool (4-6.5%), carvacrol (1-4%) and terpinen-4-ol (0.2-2.5%). Four chemotypes (thymol, linalool, geraniol, thujanol) of T.vulgaris were studied by GC-MS. 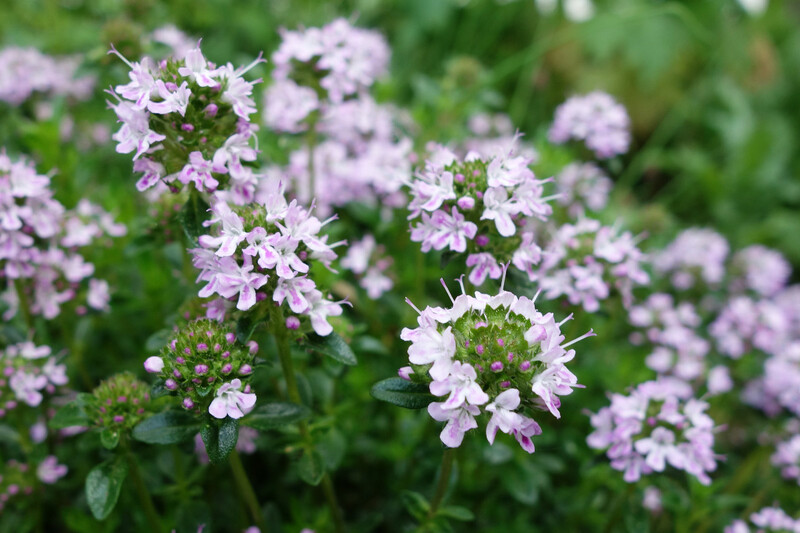 Essential oils of ct.thymol (10 samples) contained mainly thymol (28-62%), p-cymene (13-25%), and γ-terpinene (5-14%); ct.linalool (30 samples) contained mainly linalool (33.0-86.0%), trans-thujanol (tr-8.8%), and linalylacetate (0.6-9.2%); ct. geraniol (20 samples) contained mainly geraniol (13.0-67.0%), geranylacetate (1.0-58.0%), linalool (1.0-50.0%), and terpinen-4-ol (0.2-12.0%). One sample of the thujanol chemotype contained trans-thujanol (41.0%). Rotundone (5 μg/kg, peppery) is present well above its aroma detection threshold (8 ng/L in water) and apparently important to the flavour of thyme.